One of the most important hardware components inside your computer is obviously the drive that holds the operating system. If you have Windows installed on a slow hard drive, it doesn’t matter how powerful the other components like CPU and memory are, the system will boot and load programs more slowly, and lag quite badly while multitasking etc. This is a reason why high performance hard drives and especially SSD’s are so popular these days, because upgrading just that one part can breath new life into a computer and boost its overall performance. The actual hard disk or SSD performance under Windows is determined not only by the speed of the drive’s rotation or memory chips, but several other factors also. Settings such as the mainboard chipset, controller drivers, SATA/AHCI mode and RAID configuration can all have an influence. Even CPU and RAM speeds play a very small part as well. But how do you know if your drive is performing well, needs tweaking or is even holding the system back? Thankfully, the internet is not short of websites to show you how well nearly every drive around can perform. Also, loads of programs are available that can give your hardware a performance test to see how well it’s doing. 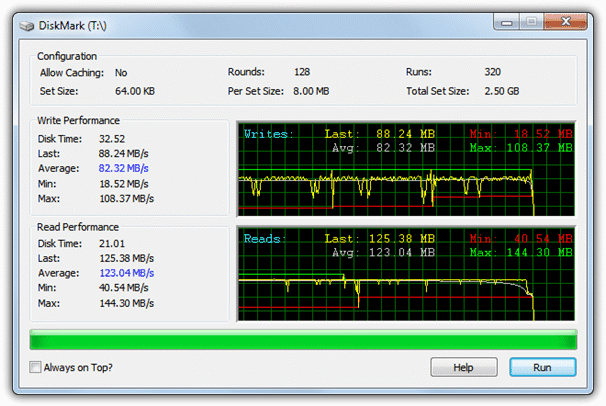 There are many paid suites around like PCMark or Passmark that can test the whole system, but here we list for you 10 free tools that are especially designed for testing the performance of hard drives and SSD drives. All tools were run on Windows 7 64-bit and are also compatible with Windows XP, Vista and 8. 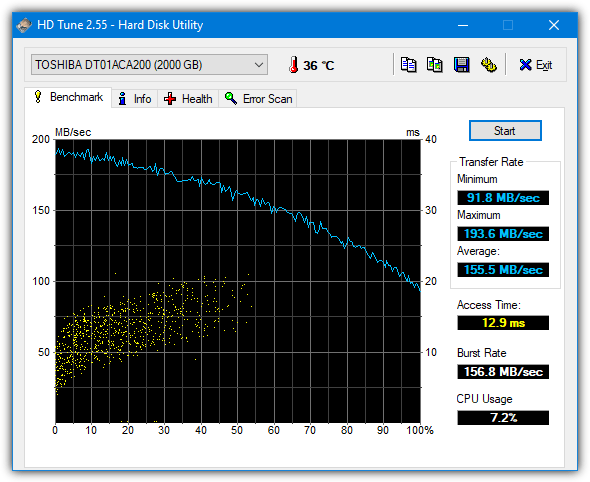 HD Tach is a rather old hard drive benchmarking tool from 2004, but still produces good results for todays drives, although it needs to be run in XP compatibility mode for Windows Vista or above. 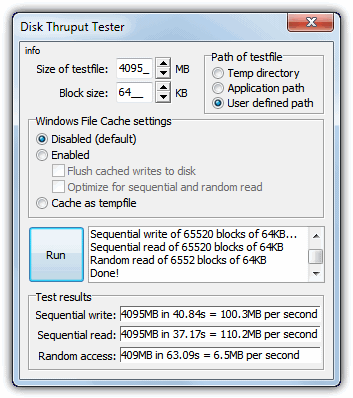 Long (32MB) or Short (8MB) block tests can be run and the results will pop up within a minute or two. 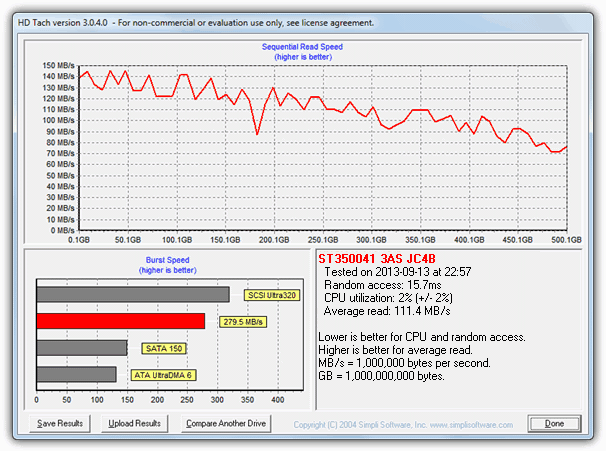 A window will show with a read performance graph across the whole drive in addition to a burst speed chart and information for CPU utilization, average access time and also the average read speed. There is a Graph Data button where you can view benchmarks for other drives in the database, although they’re mostly old scores from 2004 era hardware. HD Tach can be made portable if you extract the setup exe with Universal Extractor. This is a very popular storage benchmarking tool because it’s versatile and can produce good results for just about everything from USB drives, to memory cards, RAMDisks, SSD drives and mechanical hard drives. 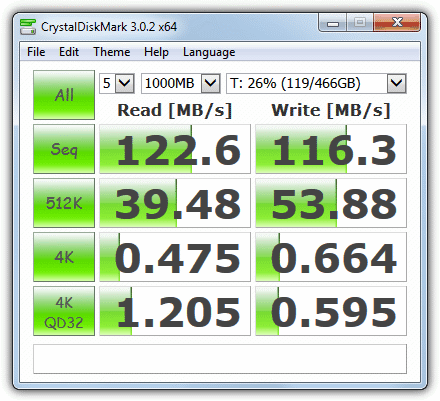 CrystalDiskMark is very easy to operate too, just set the test size between 50MB and 4GB, the drive to test and the number of passes to run, more passes obviously should produce more accurate results. Then click All to run a full test or any individual buttons below to run single tests. 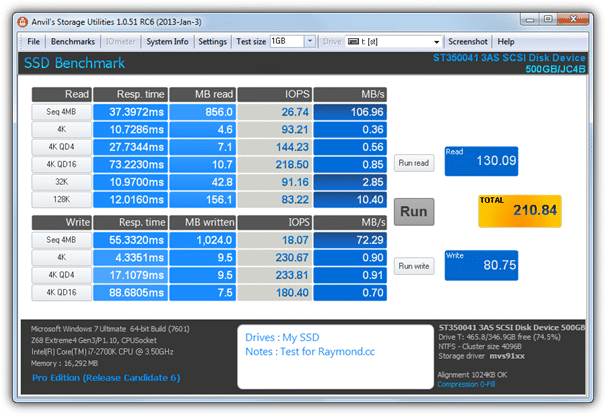 A useful extra option for SSD drives is whether to fill the test data randomly or with 0’s or 1’s. This will affect the results on drives with hardware compression such as those with Sandforce controllers. Portable and installer versions are available. 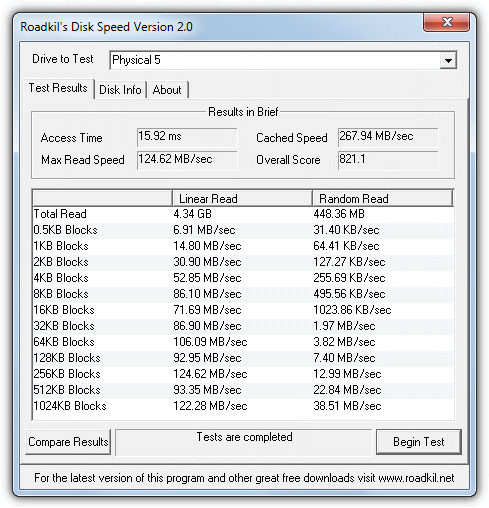 ATTO Disk Benchmark is a popular portable tool used by many hardware review websites, and is also recommended by manufacturers such as Corsair to run speed tests on SSD drives. All the tests are sequential and are taken for read and write operations using block sizes of 512 bytes up to 8MB with a test file length of between 64KB and 2GB, all selectable from drop down menus. Leaving Direct I/O enabled and the Overlapped I/O option selected will rule out odd results due to any system caching. Results can be saved out and loaded again at a later time. A look around the internet will likely find someone else who has posted ATTO results for similar hardware to your own. Almost all results you’ll find are taken using the default settings. 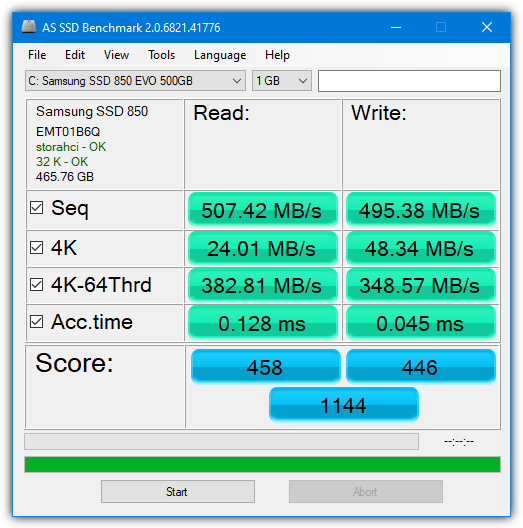 AS SSD is designed primarily to benchmark SSD drives and is another popular tool being used by hardware sites such as AnandTech’s SSD benchmark charts (which also includes ATTO) to show their results. 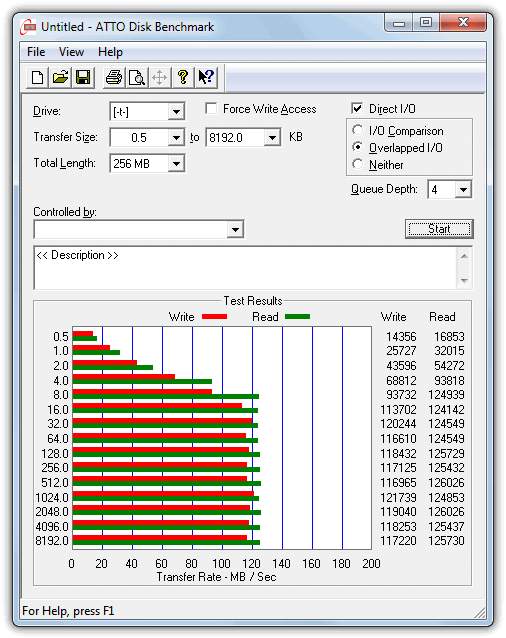 The program uses incompressible data so some SSD’s will show much lower scores than usual if they compress their data (as per the screenshot). Sequential and 4KB read and write scores will be shown along with access times and a final general overall score, the overall view can be changed to IOPS if you prefer. A couple of useful additional benchmarks are available in the Tools menu, a Copy benchmark which simulates copying an ISO, game and a program, and also a read/write compression benchmark. AS SSD is also completely portable. 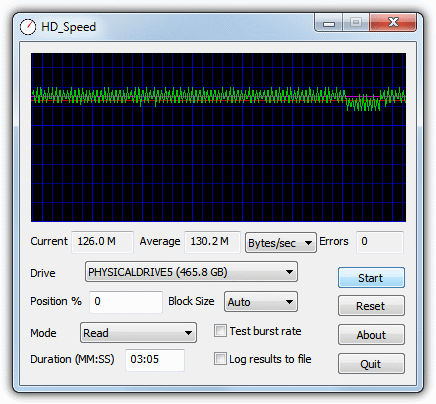 HD Tune is probably the most well known hard disc drive benchmarking and diagnostic utility and will likely be in every tech users USB toolkit. The free version 2.55 is getting old now having not been updated since 2008 and might have minor issues with some of the latest hard drive models, although functions like error checking and benchmarking should still work fine. After a test, the benchmark result graph will show the minimum, maximum and average read speed along with the average access time in milliseconds and the burst rate. The block size can be changed in the options from 512 bytes up to 8MB and a slider can move between faster or slower more accurate test speeds.